Well, Almost Family finally rebounded today. There was even a decent continuation in the after-hours market, to top it off. Regular trading hours gain was at 7.62%, with decent volume for the day. 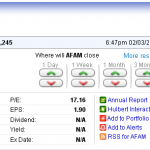 Ideally, I’d like to see AFAM rise back above the 200-day moving average, which is sitting at about 35.00 right now. At the very least, some follow-through tomorrow will be critical to keep momentum going. PHM was no slouch either, taking on 6.64% for the day. Not sure if that’s a good sign for the earnings announcment tomorrow, though. Analyst estimates have Pulte coming it at a 71-cent loss on the quarter. We’ll find out tomorrow after the close with the official report. Tomorrow and then the remainder of the week should determine what these shares will do through expiration day. Net result was a $750 swing in the value of my account from yesterday’s close, bring it back over $4200. That’s essentially break-even on the two active trades I have going right now. Probably a bit volatile for some out there , but I’ve learned that’s part of the game. I hope this isn’t too close to gambling, as I certainly don’t want it to be. I have to be consistent about staying on top of my positions and their underlying stocks to make the right decisions. We’ll see if tomorrow backs me up, or stabs me in the back. Good night, all! This entry was posted on Tuesday, February 3rd, 2009 at 11:36 pm	and is filed under After Hours, Position Update. You can follow any responses to this entry through the RSS 2.0 feed. You can leave a response, or trackback from your own site.